After the great amount of success for ONE’s first webcomic to anime adaptation, One Punch Man, a lot of the anime community was clamoring for more. That show was fun, provided some commentary on the superhero genre, and was something a lot of people didn’t expect. Rather than be met with a second season like many had hoped, instead we were given another adaptation of a different ONE webcomic: Mob Psycho 100. Did this follow up live up to the hype or should things have stopped while they were ahead? Let’s find out! 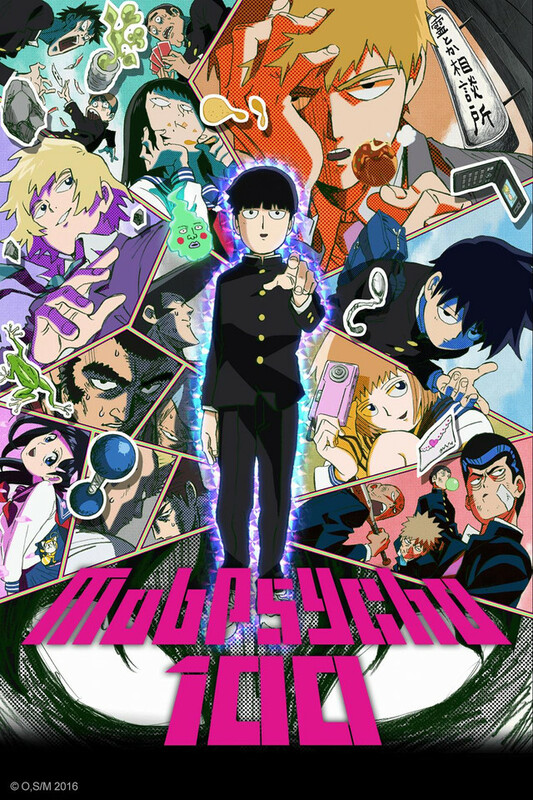 Following Mob, a kid with insane psychic abilities, and his mentor Reigen, Mob Psycho 100 explores the shonen formula while often thinking outside the box. This is both in terms of writing and visual presentation. While it can often still feel like a typical shonen story on the surface, the end product offers a unique experience in a short twelve episode run. Mob Psycho 100 opens with this crazy section of animation that is going to offer just a taste of everything that the show has to offer in terms of visuals. Immediately, you are going to notice that this anime doesn’t look like your traditional anything. It’s very much its own unique style. If I had to compare it to anything visually, I would loosely compare it to Ping Pong. This is where some viewers may be inclined to tune out. While I can understand that the rough way things appear at first glance can be off-putting, this would be a mistake because Mob Psycho 100 takes the traditional shonen formula and does something interesting with it. I’m reminded of a YouTube video by Super Eye Patch Wolf, which I strongly recommend you view. As he mentions in the video, there are a lot of similarities between Mob Psycho 100 and One Punch Man early in. This isn’t all that surprising given that they are both works written by the same person. However, I actually found Mob Psycho 100 to be a better constructed show overall. What contributes to this is that Mob is a flawed character who doesn’t really believe in himself but wants to improve without the aid of his psychic abilities. The show places a lot of emphasis on self-improvement being more valuable than natural talent and ability. This is a theme that isn’t usually explored much so this alone is something that makes Mob Psycho 100 stand-out. You may think that having such a “weak” main character would make for a boring show but it doesn’t. As the story progresses, Mob is forced to take more of an active, rather than passive, role in his life that reflects the self-improvement that he seeks at the start of the series. While it may seem silly, another facet of the show that I really enjoyed is the gimmick of the continuous percent counter that goes form zero to one hundred. Right away you know that if the counter reaches 100% that Mob is going to unleash a spectacular display of uncontrollable psychic ability. Having this increase or decrease as the episode goes was something that was really interesting. You can see this mirrored really well in the OP. This fact isn’t just because it is a cool gimmick. Definitely, that’s part of it but it also offers keen insight into how Mob is feeling. Like in One Punch Man, Mob has a flat face and doesn’t really show much emotion so this information into how he’s feeling about any given situation is beyond valuable. Another strength of the show comes in its characters. Both Reigen and Mob’s brother are interesting members of the main cast. Reigen is this conman character who, at first glance, appears to be sleazy and irredeemable but turns out to absolutely steal the show with his surprisingly good advice and wisdom. He also provides a fair bit of humor to the show. This isn’t even mentioning the incredible finally. Mob’s brother largely sits in the background but plays a larger role with each passing episode. It’s really obvious where his character is going to end up almost immediately, but I was surprised that there was more depth and thought put into this otherwise simple character and arc. Circling back to One Punch Man, one of my major complaints with that show is that the rest of the cast outside of Saitama and Mumen Rider is largely uninteresting. A lot more emphasis is put onto the situations and less so on its characters in that show. While I only singled out two characters in Mob, a majority of its cast is interesting. This includes both the heroes and villains of the cast. Now for the not so good. Dimple is absolutely awful. His design, character, and just everything about him. This is absolutely a personal complaint though. The reason I don’t like him is that he is annoying and is kind of an artificial way to get a certain plot point rolling in a way I wasn’t crazy about. Something that is more likely to bug the typical viewer is towards the end of the show. I have mentioned how Mob Psycho 100 is fairly unique and plays on expectations and ideas from the shonen formula, but towards the end it basically becomes exactly what it is trying to subvert. I wouldn’t say it reaches a point of ironic mediocrity, but it was somewhat disappointing to have the show fall into the trap of trying too hard (even if it was brief). And that’s really all I have to say in terms of negatives. The show is just solid. To answer my question at the beginning, Mob Psycho 100 definitely delivered and may have even surpassed One Punch Man as a follow up adaptation. If you are looking for something unique that still doesn’t stray too far from the norm, then this is a must-watch. What are your thoughts on Mob Psycho 100? Did it deliver more than you expected or were you ultimately disappointed? Let me know your thoughts in the comments below. If you enjoyed this article and would like to support the creation of more content like this from myself or my contributors then please consider becoming a patron of mine. For full details just click the button below. As always, thanks for reading and I hope to see you back here at Jon Spencer Reviews again soon! I liked the anime for the self-improvement themes, but I found the shounen stuff kinda lame and especially the stuff with the weaker psychics (I forget what they’re called). I actually like the aesthetic of the show and if I had to compare it to anything it would be animation you’d often seen on things like Adult Swim. The single best part of the show were the bodybuilding dudes because they really embodied what made the show unique. The show touched on some more psychological themes better than a lot of anime who try and kinda fail. I kinda wish it would have gone deeper with them. OPM never grabbed me, but Mob Psycho got me invested pretty quick. I should read the manga since I think ONE’s story telling is really excellent, and honestly it’s kind of simplistic but I think his art is actually really charming haha (and the ED and OP were beautifully animated in general). I’m looking forward to season 2! Fair enough, I think Mob was better overall too. Hope the manga is great too! I agree that his art is charming too. I honestly loved this anime and its art style. I love finding shows that push past the conventional anime look like Ping Pong and almost anything studio Trigger. The combination of traditional art and 3D was so great. I’ve never seen an anime that uses the paint on glass technique before and it fits so well with the high action and emotional moments of the show. My artist self was having a field day with this show. It’s on my top ten list now. Glad to hear you enjoyed it 🙂 I’m not an artist but I can appreciate the various techniques used for animating the show. Thanks for your thoughts! Even though the artstyle of the characters is deliberately underdone due to how ONE draws stuff, it ended up growing on me as I watched this show. I think one of the major perks of Mob Psycho 100 is the unique way the show goes about expressing itself in spite of the character design. However, I didn’t feel too much of anything for the characters (except Ritsu and Reigen, which you did point out), and I realised by the time Mob was fighting in the alleyway that this was just a shonen piece which started differently. That is the unfortunate bit about the show, is that it really does just become a fairly basic shonen in the end. The exception being the last few moments but… Still I think it was a fairly unique show that tried a lot of interesting things with positive messaging which I am always for. Totally agree on characters though, they were the most well put together. Nice! I’m pretty excited for that reveal!!! I hope you enjoy it if you end up watching it but I’m sure whatever you cover will be awesome 😀 Thanks again for the kind words and for reading! I’ve really wanted to watch this, art I like looking at is important to me. I have a feeling if I get used to the style I will enjoy this anime. To be fair, the source isn’t exactly great. Unlike OPM the animators didn’t have a redrawn manga to pull from either. It’s unique but no worse than Ping Pong. Takes getting used to for sure though. I found it pretty ugly to look at but I pushed on through 4 to 5 episodes but I still didn’t care about a single character and I still found it really ugly to look at, so I gave up. I just wasn’t interested enough in the characters to care about the story. I’m glad you had a good time watching this one. Lots of people really enjoyed it when it came out. That’s the biggest thing to push past so I can understand that. If you didn’t like the characters then I think stopping was a good call. Wouldn’t have improved enough for you.